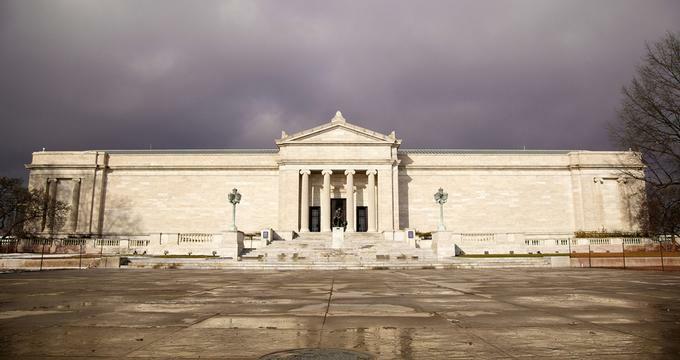 The Cleveland Museum of Art is celebrating a century of art in Cleveland, Ohio, in 2016. First founded in 1913, the museum opened to the public in 1916 on property donated by Jeptha H. Wade II. The endowments from the first benefactors—Hinman B. Hurlbut, John Huntington, and Horace Kelley, are still what supports the museum today. The museum began to be known internationally in the 1940’s and 1950’s under the leadership of Director William M. Milliken. He coordinated the acquisition of several significant works. The same year that the third director took over in 1958, the museum doubled in size. Director Sherman Emery Lee developed the Asian collection which became one of the finest in The United States. The museum also had a significant expansion in 1971 under the same director. A wing was added with classrooms, galleries for special exhibitions, an auditorium, offices and lecture halls. 1983 saw the addition of a library, 9 more galleries and the expansion of photography and modern art under the fourth director, Dr. Evans Thompkins Turner. This director was also particularly dedicated to the community and making activities at the Cleveland Museum of Art accessible to everyone. The museum is currently under leadership of its 9th director, William M. Griswold and has seen several renovations and another wing has been added in the last 20 years. 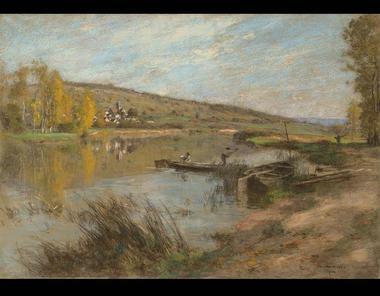 The Cleveland Museum of Art is celebrating its centennial birthday in 2016 and has many special exhibits that represent the finest collections on loan from around the world, along with six exhibits that are from the permanent collection that will be up in 2016 and going into the next year. Dan Graham: Pavilion Compilation- The artist, Graham, has been an influential figure in conceptual art since the 1960’s. This exhibition is a video works that shows the installation of six of Graham’s sculptures around the world. The artist uses two-way mirror glass to build pavilions that invite guests to interact with them—seeing themselves as they are being seen. Dan Graham/Rocks- This is an exhibit that is on display at Transformer Station and is a video work by Dan Graham called Rock is My Religion, that explores the connection between suburbia and rock n roll music. There is also a peak at his pavilion installation video. The Ecstasy of St. Kara: Kara Walker, New Work- portrays the newest of the large-scale paper works by artist, Kara Walker. These large drawings are inspired by her time spent in Rome and queries into myths and martyrdom. The newest series that will debut at Cleveland Museum of Art reflects the history of Christianity—globally and in the lives of African Americans specifically, and may be inappropriate for younger audiences. Opulent Fashion in the Church- This exhibit will run for a year in the textile gallery. Focusing on the high-quality, opulent clothing worn in the Catholic church, the exhibit has a collection of textiles that are fit for royalty. Myth and Mystique: Cleveland’s Gothic Table Fountain- the most complete and preserved gothic table fountain known is on display in the focus gallery. 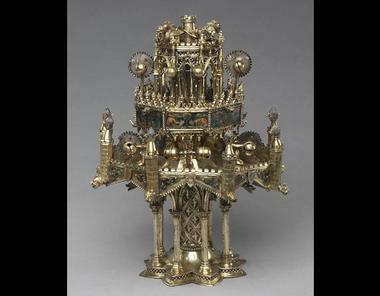 This piece dates back to 1340’s Paris, France and features creatures playing musical instruments and three tiers with bells and water wheels. Cheating Death: Portrait Photography’s First Half Century- The best 50 portraits of the first 50 years of 19th century portrait photography are displayed in this exhibit that poses a play on our selfie crazed society. Roy Lichtenstein: Little Big Painting¬- Lichtenstein is best known for his pop art of the 1960’s. He was one of the great influences of the genre and used the dot method that was associated with news print. Little Big Painting is the most iconic in Lichtenstein’s series, brushstrokes. 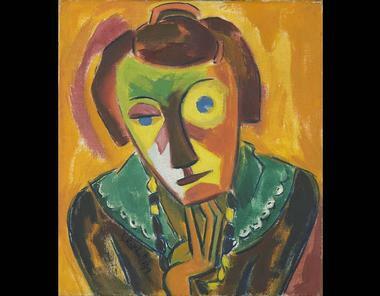 Karl Schmidt-Rottluff: Portrait of Emy-This artist was part of a german expressionism group called “Die Brucke (The Bridge). His Portrait of Emy is of his wife, Emy, who he married in 1918. This portrait is being displayed with Schmidt-Rottluf’s Self-Portrait with Hat. He painted these to commemorate their marriage. Vassily Kandinsky: Improvisation No. 30 (Cannons)- Kandinsky was one of the first painters to develop a purely abstract style and greatly influenced the art world because of it. The artist believed that abstract forms could move viewer beyond their own consciousness. Human Effigy Pipe- The state artifact of Ohio, Human Effigy Pipe, is on loan from the University of Ohio. This pipe is likely to come from the ancient Adena culture but could also from the Hopewell people who came a bit later. 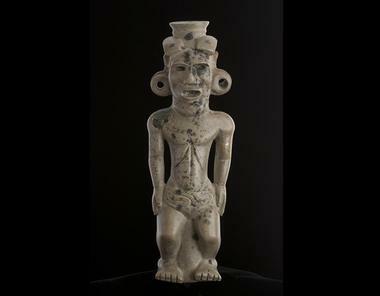 The pipe was excavated from a lavish burial mound and likely depicts a shaman, ancestor or mythological character. Tiffany & Co Archives: The Wade Necklace- Considered one of the great Tiffany masterpieces, this necklace was commissioned by one of the late directors of The Cleveland Museum of Art, Jeptha Wade, for his wife Elizabeth. The necklace to be worn at the coronation of a Moscow Prince in 1896. 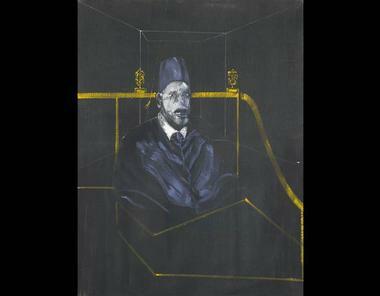 Francis Bacon: Study for Portrait VI- is a painting often described as disturbing. A ghostly figure sits isolated in a dark room; mouth open in a scream. This painting is part of a series that is meant to contemplate the mental anguish artists are feeling in the time of existentialism. Jan Van Eyck: Madonna at the Fountain- Van Eyck is one of the premier Renaissance painters of the 15th century. He worked for the Burgundian Court almost exclusively and was court painter to Phillip The Good. He painted in a realist way using light, color, oils, draperies, and virtuoso technique to make his painting seem more like what photographs are today. Orazio Gentileschi: The Lute Player- The Baroque artist painted from live models and embraced a more naturalistic form of art. This piece is considered one of his greatest masterpieces and was painted sometime in the early 1600’s. 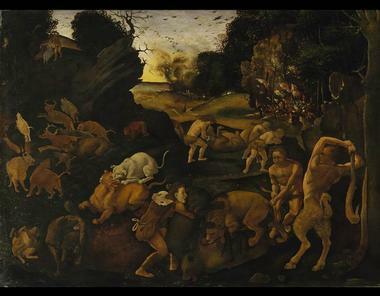 Piero di Cosimo: A Hunting Scene- inspired by a poem by the Lucretius, a Roman philosopher and poet, called De rerum natura this painting depicts a mythological hunting scene between humans and satyrs. This painting is on loan and the artist is not currently in the collection of Cleveland Museum of Art. This gallery uses art, technology and interpretation to explore the permanent collection of The Cleveland Museum of Art. Not only do visitors get to see real works from the collection from artists such as Pablo Picasso, Giovanni Panini, Auguste Rodin, and many more, they get to learn how the pieces were made, fun facts about the artist or work. Gallery One also features the largest multi-touch micro tile screen in the country that displays the 4,100 items in the museum’s permanent collection. These artifacts can also be viewed online. Visitors can get interactive with the galleries using ArtLens app on their smart phones. There are over nine hours of programs such as audio tours, content and videos, and even a map that can guide you through the museum if you get lost. This part of The Cleveland Museum of Art is the most fun and family friendly. Through interactive play, visitors can get up close and person through virtually engaging with painting and other works in the museum. The Create Studio allows visitors to create their own self portrait that mimics the style of one of the painters in the gallery through technology, a virtual pottery wheel that uses the hand motions of the artist on a virtual wheel to design a pot, a collage maker where guests can snip pieces of art as though out of a magazine and create collage art, and paint play where motion tracking software can pick up on your air brush strokes to put your design on paper. Reveal and Zoom is a program that allows visitors to look a composition without the details and then zoom in using 4k technology to see the fine details of the painting. Using interactive technology, visitors will use body movements to reveal the painting on the screen by slowly examining section at a time. There are matching, memory and line/shape drawing games as well that get the whole family up and moving to interact with and explore some of the most significant art in history in a way that has never been done before. There are many yearly special events that take place at Cleveland Museum of Art including a New Year’s Eve Party, Winter Lights Lantern Festival, Mix and Parade the Circle. There is also a huge Summer Solstice Festival every year and in 2016 there are many events that are celebrating the centennial of the museum. For the much- anticipated centennial celebration, the museum had an official birthday party in June 2016. There was also a weekend celebration and the festivities last all year through the special exhibitions that are on loan from acclaimed museums from around the world. There was also a large Centennial Celebration this fall that had live music and dance performances. There are several programs that are put on by the museum to enhance education such as second Sunday family fun days, talks, lectures, panels, discussions, and art classes in The Studio for ages 18 months and up.